Ice XVI. White edges mark the unit cell (~17 Å). Ice XVI is the least dense (0.81 g/cm3) experimentally obtained crystalline form of ice. It is topologically equivalent to the empty structure of sII clathrate hydrates. It was first obtained in 2014 by removing gas molecules from a neon clathrate under vacuum at temperatures below 147 K. The resulting empty water frame, ice XVI, is thermodynamically unstable at the experimental conditions, yet it can be preserved at cryogenic temperatures. Above 145–147 K at positive pressures ice XVI transforms into the stacking-faulty Ice Ic and further into ordinary Ice Ih . Theoretical studies predict Ice XVI to be thermodynamically stable at negative pressures (that is under tension). 1 2 Falenty, A.; Hansen, T. C.; Kuhs, W. F. (2014). "Formation and properties of ice XVI obtained by emptying a type sII clathrate hydrate". Nature. 516 (7530): 231. Bibcode:2014Natur.516..231F. doi:10.1038/nature14014. PMID 25503235. ↑ Conde, M.M. ; Vega, C.; Tribello, G.A. ; Slater, B. (2009). 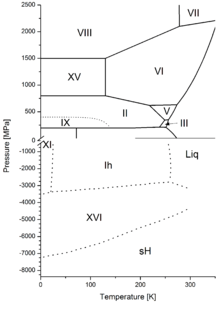 "The phase diagram of water at negative pressures: Virtual ices". The Journal of Chemical Physics. 131 (034510). doi:10.1063/1.3182727. ↑ Jacobson, Liam C.; Hujo, Waldemar; Molinero, Valeria (2009). "Thermodynamic Stability and Growth of Guest-Free Clathrate Hydrates: A Low-Density Crystal Phase of Water". Journal of Physical Chemistry B. 113 (30): 10298–10307. doi:10.1021/jp903439a.